For 140 years after Easter Island was discovered by the outside world, some of its most remarkable treasures remained unnoticed. These treasures were the talking boards  wooden tablets like the one pictured on the right  each covered with characters of an unknown language. The Brother Eugene Eyraud. When he spotted them in the 1860s, he found that the islanders had been using these irreplaceable keys to their history for firewood. With their leaders kidnapped or killed by slavers from South America, they had nobody to decipher the script. Scholars were keenly interested in Brother Eyrands find, for the boards were the first examples of a written native language that had been found anywhere in the South Sea islands. But by the time the salvage campaign got under way only a pitifully small number were left: just 21 tablets, and a handful of other artefacts with inscriptions. As the years passed, linguists puzzled over the boards. At first, some dismissed the marks as cloth-printing designs  pretty but meaningless. Others tried to link them with the picture writing of a tribe of Panamanian Indians, with rock paintings of Australian aborigines, with Egyptian hieroglyphics, even with 4,000-year-old inscriptions in the Indus Valley in India and Pakistan. None found the answer. Then in 1953, a German scholar, Thomas Barthel, took up the challenge. He reasoned that since the script contained about 120 symbols combined into more than 1,000 signs  far more than would be needed for an alphabetic or syllabic system  each sign must stand for a complete word or idea. But he still needed some key to get him started. He found it by following a clue from the previous century: the story of an early Easter Island investigator, the French Bishop Tepano Jaussen. The bishop was known to have found on Tahiti an Easter Islander who had been trained in his youth as a professional chanter  a rongorongo man. The story went that the man, Metoro Tauara, had been able to chant songs from four of the boards the bishop had collected. The bishop had noted each song in Polynesian and then found, to his dismay, that Metoros translations made no sense at all. By 1960, Barthel had begun publishing his translations  showing the boards to contain mostly prayers to gods, instructions to priests, and accounts of island mythology. But there are too few boards to be absolutely sure, and some of Barthels translations have been rejected by other experts. Nevertheless, Barthel believes that here is enough evidence to show that the writing was developed by Polynesian wanderers. Only 21 talking board tablets like this one survived the collapse of Easter Islands culture. In this form of writing, each line turns back on the one before like the furrows in a ploughed field. 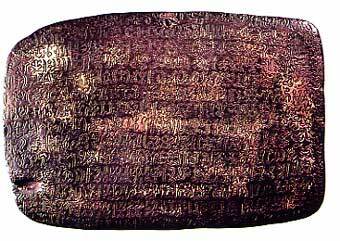 Other writing of this type has been found in the Pacific, from Sumatra to the Marquesas Islands.